Fertile soil drew white settlers to the backwoods region of North Carolina in the early eighteenth century after the conclusion of the Tuscarora War. By the mid-eighteenth century the area that would become Greene County, then a part of Dobbs County, was sparsely settled, with prime sites along Great Contentnea Creek serving as landings when the creek was high enough to allow for transportation of people and goods. Influential farmers and landowners built at least one tobacco warehouse along Great Contentnea Creek and constructed more permanent houses and outbuildings. Greene County has one exceptional home built in the late Georgian-style dwelling known locally as the Henry Best House, located at the Fort Run community’s southwestern edge. It was into this time and place, and probably in this very house, that Benjamin Williams Best was born in 1818. Benjamin W. Best was the only son of Robert(Robin) and Elizabeth Best, his father being the youngest of eleven children born to Benjamin Best Sr. (1740-1805), a prominent Dobbs County settler and landowner who built the 1790 Henry Best House. Robert Best inherited the house upon his father’s death. The Best family, like many eastern North Carolina “first families”, settled in present-day Greene, Wayne, and Lenoir counties, and a small number of extant dwellings in that area are associated with them. Benjamin Williams Best took his middle name from his grandmother, Benjamin Best Sr., a second wife Margaret, who was also from the immediate area. Benjamin W. Best married Susan Louisa Exum of Wayne County on August 10, 1841, and the first of their six children, James Hiriam Best, was born on February 16 1843. Moving northwest from Fort Run, closer to his wife’s family, Best purchased land in the Bull Head area and constructed his substantial house and all around 1850 just west of Beals Branch, a tributary of Nahunta Creek. By that time his 900 acre plantation was worth $5,400. By 1860, Benjamin W. Best’s household included his wife, ten children, his brother-in-law, W. P. Exum(a doctor) and three wards, two of whom were related to Susan Exum Best. His oldest sons, James Hiriam and John Robert, were going to school but simultaneously helping him with the farm. Susan Best died in July 1863, soon after the birth of her last child, Eddie Exum, on June 10. Benjamin Best, unlike many antebellum farmers, managed to retain his land and property after the Civil War. In 1870 he owned 400 improved acres and 687 woodland and unimproved acres valued at $6100. In 1880 Benjamin had turned the management of his farm over to his son, John Robert Best./ Three other sons and a housekeeper, Patsy Coltrain, also lived on the property. Some land had been sold, leaving 800 acres. Best’s operation was successful enough to merit a statewide mention; Branson’s North Carolina Business Directory listed him, not his son, as one of Bull Head Township’s nine successful farmers in 1884. Benjamin Best died in 1890. 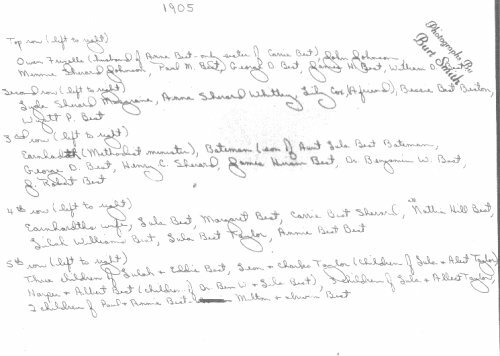 The following year Mary A. Exum, his sister-in-law, purchased the house and acreage from Benjamin W. Best’s executors. She apparently rented the house to James Hiriam Best, the eldest of Benjamin and Susan’s children, as he is listed in the 1896 Branson’s North Carolina Business Directory as one of the fifteen prominent farmers, and the only Best in the Appletree community. Mrs. Exum sold the house and 100 acres to Paul M. Best in 1902. 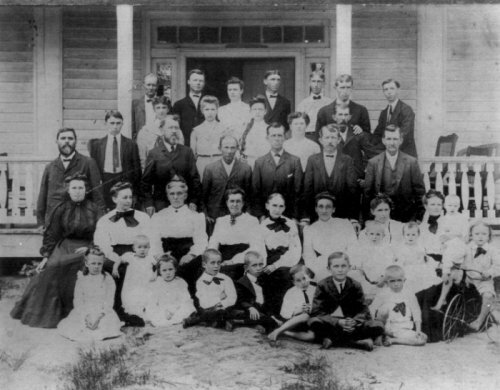 Three years later Paul Best had a family reunion at the Benjamin W. Best House, and five of B. W. Best’s surviving sons – Wyatt P., George D., James Hiriam, Benjamin W., and J. Robert – attended the event and are documented in a family photograph taken at the house’s front entrance. By the mid-twentieth century the house had been sold out of the Best family. The Benjamin W. Best House was threatened by destruction in `1997 when its owners decided that their tract needed more farmland and that the then-vacant house was superfluous. Following intervention by Preservation North Carolina, Ossie and Mary Betty Kearney purchased the house in 1998 and, because it could not remain on its original site, moved the house that April 7th to its current location ten miles south. In its new location, the house stands less than two miles southeast of the Henry Best I House and approximately three miles west of the Best-Harrison House, a turn-of-the-nineteenth century dwelling constructed for another descendant of Henry Best. The Benjamin W. Best House has completely been renovated to its original status and was listed on the National Registry of Historic Places in February 2006. This farm house is located on a working farm in the Jason vicinity and is open to the public upon appointment. It presently is operated as a country inn.